This week the newest entry in the Non-Combat Magical Item series will contain two smaller entries. These aren't big exciting items, but they definitely spice up the campaign world, while keeping combat balanced. As always these are system agnostic, but really fit well into 5th edition, because of bounded accuracy, and how easy it is to unbalance your combat. This platter is commonly given as a wedding present among wood elves. When placed in direct moonlight the plate will be magically filled with food. Each plate has a different magical food that it summons, dessert, fruit, meat and cheese are all very common. In fact, wood elves rarely eat meat that isn't summoned from one of these plates, as they find the act of killing an animal to eat distasteful. Each plate can only summon food once per night, and the food must be eaten in the vicinity of the platter, any food brought too far away from the platter will vanish. If the food is eaten it provides normal sustenance, and is very delicious. The more expensive and well-crafted the platter, the better tasting the food. It is rare for a non-elf to carry one of these plates, and if one were to come into legitimate possession of one, they could count themselves among the elf-friends. This is the perfect item for the sneaky fraudster, blackmailer, or imposter. It appears to be an intricate but normal looking quill pen, but when blood is placed in the ink well, it allows the writer to perfectly impersonate the person from whom the blood belongs. The quill will not only perfectly impersonate the handwriting of the victim, but also the mannerism in which they talk, including but not limited to any spelling mistakes they tend to make, any colloquialisms they frequently use, or any other way that a reader could identify the author. The blood is changed to the appearance of whatever ink the victim usually uses. The user of the quill still has complete control over what is written, but writing in the hand and voice of the victim seems completely natural while using the quill and blood ink. The victim would even find themselves questioning whether they wrote anything that was written by this pen, and magical means would be required to determine the forgery. This Sunday Blog post isn't going to be the stories from my personal table I had planned. I'm thinking of switching up what gets posted on Sunday's, so I'm going to experiment a little bit. For this post it will be a review of a book I recently bought. Although this blog is mostly focused on 5th edition Dungeons and Dragons (although I think it could be useful for DMs and players of any system), this book was written for Advanced Dungeons and Dragons back in the 80s. The book of Marevlous Magic, written by Frank Mentzer and Gary Gygax was definitely an entertaining read. I bought it used for pretty cheap on Amazon (link included above), so it wasn't a lot of money out of pocket. For entertainment purposes, and a look at where the came has come from, I definitely recommend it. Plus it is cool owning one of the older D&D books. That isn't too say that by today's standards this book is fantastic or anything. Magical items found in the Dungeon Master's Guide, (or even a certain Non-Combat Magical Item Series) are far superior. One thing I'm particularly not fond of, is that every item comes in 4-10 variations. For example, when the player finds a pipe, the DM rolls a d6 to determine whether the pipe is an aromatic pipe (can make any smell, including garlic to deter vampires), pipe of puckering (permanently causes the lips to be stuck in a pucker position, all talking must be done in grunts or things motions that don't require the moving of the lips), the bubble pipe (bubbles fly out and stick in everyone's eyes, causing a penalty on rolls for one turn, except for the user for whom it is permanent). At first having variants of each item seems like a good idea, the user doesn't know if they're going to get something good or not. However, these items seem very heavily slanted for bad items, so many of the items cause a very annoying permanent curse on the player, only removable by a remove curse spell. Since all of the pipes are supposed to look about the same, and the player doesn't know whether they have an aromatic pipe or a bubble pipe, they won't know until they get cursed. And at least to me, bubbles being permanently stuck in your eyes causing a penalty seems less like a fun curse, and more like an annoyance, besides also being a stretch on the imagination. The book itself is soft-cover paperback style, although about the same height and width as modern books. It's organized well, but contains much less artwork as similar, more recent books. The book isn't completely useless, I'm happy that I bought it. Not only is it a piece of history, and very cheap. It is a great source of inspiration for future items in my campaign, as well as the Non-Combat Magical Item Series. The Nail of Building is a single metal nail used in construction of a building, the nail can be pried out after construction, causing the entire structure to disappear. It can then be easily transported and a magic word can make the structure appear in its new home. The Ether Oar appears to be a normal wooden oar, but when a magical code word is uttered, it opens a magic gate on the water to the ethereal plane, the canoe or other wooden vessel can enter the ethereal plane, travel a distance and repeat the code word to return to the material plane. Many other items are less likely to be directly imported into a modern campaign, but reading through them gave me a large list of inspirations for items that I will try to write about on this blog. If you're looking for inspiration, and a piece of Dungeons and Dragons history, for a pretty affordable price, then I would recommend this book. If you're looking for items that fit modern guidelines, or books with roll tables where every single item can be easily added to your campaign, this book isn't for you. In case anyone is interested we have a new Facebook, Twitter, and Google Plus, account set up for the blog. Follow whichever one that is most convenient for you to get updates on new posts. Be sure to let us know if there is anything you want to see on the blog, or any type of social media you'd like us to use. Our last Online Tools Saturday Grab Bag was popular, so here is a sequel. All of these tools are designed with 5th Edition Dungeons and Dragons in mind, but could likely be adapted to any by a crafty Dungeon Master. First up is the College of Lore. I've only recently heard about this site, but it seems like a very cool place to find homebrew lore written by the community there. I love it because it is heavily focused on fluff and lore, instead of rules and damage. (Which I'm a huge advocate for, evidenced by the Non-Combat Magical Item Series, Article 1, Article 2, and Article 3). I highly recommend that you check it out. You can also contribute if you're interested. I really love this treasure generator. It's very customizable, and even includes a section for generating spellbooks. This is definitely the best treasure generator for hoards that I've ever seen. One thing I really take advantage of is the "Chance of Item Quirk" setting. As a DM I often never knew when to give an item a quirk, this makes it easy. Lastly is this character generator from Pathguy. It's a little rough around the edges, and fairly slow running, but it is a great tool to create a player character (or NPC built like a player character) in a pinch. There are many options, some of which would be considered homebrew, but it can definitely help in making a character quickly without having to flip through the Player's Handbook too much. This faction is known as the Weeping Friars, a religious faction of monks whose primary belief is that there is a finite amount of pain and suffering in the world. The monks do what they can to take as much of this suffering for themselves as they can, so that, in their minds at least, it prevents others from having to suffer. The Weeping Friars are often found travelling the world accepting punishment and suffering wherever they go. They often ask for donations in return for their suffering, but will often do it for free. Donations are just as likely to take the place of alcohol as money. Few take the Weeping Friars seriously, and many rougher sorts will take pleasure in throwing glassware and rotten vegetables at them, if not entirely physically assaulting them. Brother Tiggin, our NPC of the week is slightly different the average Weeping Friar. He has a great talent for entrepreneurial ventures (which he likely gets from his father, who convinced the Weeping Friars to pay for Tiggin as a new recruit when he was a young boy). Tiggin wants to create more organization within the Friars, with ranks and paygrades. Instead of working for donations he wants to move to price lists and cost structures, based on the degree of suffering. Ideally Tiggin thinks much more suffering could be kept from the masses if he earned enough money to outsource instead of taking on the suffering himself. Besides the ideological differences in how to suffer to save the world, Brother Tiggin is definitely a true-believer in the idea of finite suffering in the world, and that the world can be made a better place by having people purposefully taking on suffering. The illusion or phantom army is a quick adventure idea or inspiration that I've been working on that I wanted to share with you. The party of noble adventurers comes upon a very frightened town known as Diphule. This town exists along some sort of road or path, possibly in a mountain pass. All of the towns and villages further down the pass have been sacked by an extremely large army. Armies this size are unheard of in this area. No one knows what nation or city this army belongs to, but it is lead by a man named Lance Fanta. Luckily the towns fled to the mountains (or hills, forest, water) when the massive army threatened to attack, so nobody was injured. However, many of their valuables were stolen, and their houses burned. The army has now come to Diphule, and the town is split on what they should do. The majority want to run, but the mayor is a proud young man, having just taken over for his late father at the beginning of the year, and he wants to stand his ground. They wonder what the adventurers think, and if there is anything they can do to help them. The army appears to be thousands of men large. The reality of the situation is that Lance Fanta is a powerful mage when it comes to illusions. He isn't very good at other spells, but he is fantastic at realistic and numerous illusions. The army is simply an illusion or phantom. He will try everything to intimidate the town and steal their artifacts when they leave. He is horrible and fighting, and will always rather run or trick an assailant. Lance Fanta's motivation is that he is the youngest son of a family of evil mages. All of his family have plundered and killed many adventurers and farms. They have told him to go do the same, not to come back until he has a large pile of treasure. Lance doesn't really want to hurt anyone, and in his heart of hearts just wants to be an entertainer with his illusions. His dream is to entertain kings and kingdoms with his self-written dramas and comedies, acted by (and special effects) illusions. But he is afraid his family will hurt him if he doesn't do what they say, which they probably will. This weeks Roll Table: Lasting Damage. This post starts the return to a normal posting schedule. Back to everyday if possible. This table is designed to be rolled upon whenever a player gets injured in some way that will cause longer lasting damage, something longer than just hit point damage. This can be rolled upon with a crit fail, or when a user takes death saves, to create a bigger sense of danger. This damage should be flavoured to how the player got hurt. If he got knocked unconscious by fall damage then he probably wouldn't have a severed ear, so reroll if it doesn't make sense. 1 Broken Leg - Your leg has been broken, without healing magic or potions this will cause movement speed when walking or running to be halved. Any dexterity based armour bonus is halved as well. 2 Concussion - Your head is pounding, skill checks for INT, WIS are halved or done at disadvantage. Healing magic fixes instantly, or a long rest. 3 Broken Arm - Your arm has been broken, without healing magic or potions this will cause physical attacks to be done with disadvantage. The amount of weight that can be carried is halved, and heavy weapons or shields cannot be carried with that arm. 4 Broken Jaw - Your jaw is broken. Talking is very painful, and as a result CHA skill checks are done at disadvantage. Spells with a spoken component require a DC 10 constitution saving throw to be spoken. 6 Severed Nose - The tip of your nose has been severed. Helmets with a nose bridge will be painful until the wound heals over, and you are much uglier than before. CHA skill checks are at disadvantage with strangers of noble heritage, or people who are in any way unused to rougher looking people. Once they get to know you this is negated. 7 Severed Ear - Your ear has been severed. You look pretty ugly. For two days perception checks that rely on hearing are at disadvantage while it heals. CHA skill checks are at disadvantage with strangers of noble heritage, or people who are in any way unused to rougher looking people. Once they get to know you this is negated. 8 Missing Eye - You are missing an eye. An eye patch of some sort makes you less ugly, but either way you won't be winning any beauty pageants. Perception checks involving distance or something off to the side with the missing the are at a disadvantage. CHA skill checks are at a disadvantage with strangers of noble heritage, or people who are in any way unused to rougher looking people. However intimidate skill checks are at an advantage. Once they get to know you this is negated. 9 Severed Leg - Your leg has been severed. Without a peg leg or crutch movement is incredibly difficult, and cut to a quarter of your speed. With a peg leg or crutch this is increased to half of your normal speed. Dexterity based armour is halved. Getting up from a prone position takes all of your movement speed. 10 Severed Arm - Your arm had been severed. Nothing can be carried by that arm and your carry weight is halved. Any spells that require a free hand still do. You can't carry a shield or use a two handed weapon. You may have noticed that a lot of the blog posts here arne't vrey pollished. They may seem like they've been whipped together without too much thought, aren't focus-grouped or even very edited. This is for two reasons, the first one is that I'm a lazy person, the second is that I'm a lazy DM. Laziness doesn't have to be a bad thing. Sometimes I notice dungeon masters spending what I consider far too much time prepping for a game. RPGs don't need intricate maps, miniatures, they just need a group of friends hanging out, telling a story together. Laziness can help you realize where your time is best spent, and not turn your favourite hobby into a chore. I write this blog the same way I prep for a DM session, I formulate ideas and some starter concepts. When I'm actually at the table I try to go with the flow and improvise. I expand on what works at the table, and shrink down what doesn't. That's what I expect people to do with what I write here. Get inspiration, use it as a jumping off point? But don't get carried away with preparation. Remember to have fun. This Thursday's Adventure is more inspiration than a full-fledged adventure. Also I just want to reiterate that over the next couple of weeks there will likely be some missed blog posts as I get busy for my wedding. I'll try to update as much as possible, but thanks in advance for being understanding for any posts that I miss. This is a really small concept blogpost but I hope that you can get inspiration to use in one of your campaigns. Your party of adventurers in some way angers a magical being. A Hag, fiend, wizard, warlock or something of that nature, I'll choose a witch. The witch will escape the players, and at the last moment will curse them with cryptic parting words. "Treat me poorly to your woe, friend and foe, you'll never know!" or something along those lines. The next interaction the players have will be entering some sort of settlement. The settlement seems devoid of all civilized life as they approach, and when they get closer they see it has become overrun with goblins and orcs. Many of them seem to be holding weapons, they refuse to communicate, even in their own languages, and will defend themselves if attacked. The fight is quite easy for the players, and they will likely make a first strike. The goblins and orcs are not as they seem. They are normal villagers, the curse caused them to see all friendly humanoids as evil, threatening humanoids. Anything they are holding appears more menacing, tools become weapons, food becomes human flesh. The party must try to discover the curse as quickly as possible, or risk murdering civilians. There will likely be consequences to their actions, and the witch may need to be sought out to end the curse, or a remove curse spell would need to be cast. 1 Monarch's Birthday - This King, Queen, Prince or Princess' Birthday festival is the talk of the town for months ahead of time. The monarch may be uncharacteristically generous, since it is for a noble cause, the celebration of themself! 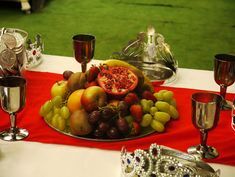 A great feast is sure to be had, while gifts are tributed to the crown. 2 Madame Thul'sad's Travelling Circus - No one is ever quite sure when the circus is going to come to town, but rumours tend to pick up when the Madame's circus stops in nearby towns. (Although sometimes it seems that her circus will appear out of nowhere, not even having been seen travelling on the road). Not much is known about Madame Thul'sad, but her circus has many freaks (such as the savage elf and the calm orc, the giant dwarf). Many of the discriminated races are over-represented in the circus, tieflings and half-orcs especially. Tricksters and magic are available for viewing, and strange monstrosities. There is always an interesting magical item or monster to interest any adventurer. 3 High Heaven's Holy Handful - Five days, one for each finger of a hand, where the clerics and priests of the land put aside their theological differences, to enforce their beliefs on the populace much stricter than normal, further restrictions are added to instill the values of piety and self-sacrifice. The list of things banned during these five days is impossibly long, including alcohol, fighting, sexual relations, food (besides stale bread and water at sundown), dance, music, gambling, and games of any sort. Because of all of these restrictions, the day before High Heaven's Holy Handful is filled with sin and excess, causing many to nickname it the Hell Before 4H. 4 Abyssaleem - This old tradition originally has it's roots in a practice of once a year dressing up as scary fiends, demons, and devils to scare of monsters and goblins from raiding a town's harvest. Nowadays it is just an excuse to get dressed up as the scariest kind of creature you can imagine and scare each other, while consuming large quantities of ale. Scary isn't always the intention, as the increase in popularity of dressing up as Succubi can attest to. Some of the more outrageous citizens have even speculated that this would be a good time for fiends and devils to infiltrate the general populous, either for nefarious purposes, or to experience life as a mortal. 5 Sacrific - This dark day is thought to keep evil spirits at bay for this unfortunate town. Every year twenty poor souls are chosen to be sacrificed in return for a safe and happy year. This number tends to be bigger in tough times but never goes below twenty. These twenty people are tortured and sacrificed, each in a unique way, publicly, by their closest family members and friends. After everyone is sacrificed, the clerics and priests call upon their gods to raise them back to life. No one is sacrificed more than once, and before the sacrifice no one discusses raising the victims back to life. The success rate for the resurrection is very good, although sometimes it doesn't seem to work and no one knows why. 6 Battle of the Bard's - This town is known for it's very unique festival, that happens to be starting right away, the "Battle of the Bards". Entertainers from all around the land, as well as their teams, groupies, and fans, flock to the town to compete in a head-to-head tournament. The winner gets international fame, a large cash prize, and often a magical instrument, depending on the year. The winner's are often the most musicians and entertainers in the world (and perhaps not of this world). 7 Tradesman Day - Local woodworkers, blacksmiths, fishermen, barkeeps and all manner of other civilian occupations grew tired of adventurers taking all of the glory. They wanted people to realize how much skill and hard work was required to do all of the jobs in town, and how without them adventurers couldn't function. Many adventurers try to avoid town on this day, as the workers can be particularly unpleasant towards them, and they might get sucked into waiting tables or working an anvil. 8 Children's Day - To celebrate the future of society, the mayor turns his power over to a randomly determined child for day. The children host town council meetings, go to work, and stay up as late as they want. They have to make sure they have food on the table for their parents however, or their parents might throw a temper tantrum. This week for the Tuesday Quick Tip should seem obvious but it is something that lots of Dungeon Master's don't think of. Describing useless information. If the first bridge you ever describe has a troll under it, if the only time you describe a lone man in an alley is when the man tries to assassinate the party, your players are eventually going to realize that everything you say is significant. Obviously as Dungeon Masters everything we say is significant, but sometimes its important to throw in some useless information. For situation or setting, throw in some fluff that is totally useless. This is useful for two reasons. First it will acclimate your players to ignoring certain descriptions, making it easier to surprise them. Secondly, the unimportant descriptions may inspire may inspire an actual turn of events that you didn't plan during the preparation phase. All of the really cool things my players have ever done have been by taking advantage of the setting in a way I didn't anticipate. If you describe some pretty fountains, trees, bridges, and buildings, you will be surprised in what clever ways your players are able to take advantage of them. Eons ago there was a wealthy human lady who was quite the socialite named Lessiroth. Lessiroth was known for her immense beauty, and extravagant parties. Elves, dwarves, and humans would travel from across the land to attend her parties. All of the noble ladies were jealous of her good looks, especially the elves, who pride themselves on their beauty most of all. The elves would often tell Lessiroth that although she was beautiful now, she was human and those looks would quickly fade, while the elves would have their beauty eternally. Lessiroth was terrified of eventually proving the spiteful elves right, so she sought out all of the best magical artificers in the land. One of whom, lost to history now, created this amulet. Lessiroth's Amulet of Beauty Sleep allows the wearer to hold off aging when worn while sleeping. The amulet must be worn at all times, and in fact becomes very difficult to remove once worn. When the wearer goes to sleep they enter a very deep sleep, becoming near impossible to wake. The aging that would have occurred that day is prevented, and any major illnesses or ailments are cured. (Although missing body parts cannot be regrown.) This curing ability only work on a newly contracted illness, so if the amulet is worn only after symptoms begin to show it is already too late. Wearing this amulet and entering the deep sleep allows one to put off aging indefinitely, potentially living forever. However if this amulet were to ever be removed, likely through magical means, the skipped years would immediately return, flash-aging the former wearer. Any illnesses or ailments that were cured by the amulet return as well. No statblock this week for the NPC of the week. That is because Tyne, first name only no last name, isn't much for combat. Tyne is a genasi, someone with elemental heritage usually a genie. Tyne is a Sensate, (described briefly in this blog post. For more info pick up the Planewalker's Handbook). Sensate's are a faction of planeswalker that yearns to experience every sensation and experience that they can. They travel the world watching operas, playing games, eating meals, experiencing sexual acts, and anything else they can think of. Tyne was the leader of a sect of Sensates even more obsessed with experiencing every sensation than usual. Tyne also abnormal for a genasi, because he found his djinni father and tried to form a relationship with him. Tyne's father wanted nothing of the sort, being a respectable djinni of high standing, he had spoken out publicly against air elementals consorting with mortals. Tyne was the embodiment of hypocrisy to him, so in order to feel what blackmailing one's own father felt like, Tyne asked for what he thought as his birthright, a wish from his father. Tyne's wish was for the ability to truly experience every experience, taste every taste, live every possible life. His father granted it, in his own selfish way, so that Tyne could never appear and disrupt his life again. He made Tyne spiral through the planes, and through time itself, living for millenia, but only a few days in each time period. Tyne may spend a few hours, or a few weeks in a specific time period. Later in his lifetime he may learn to control his passage through time, but for now, he is spiraling through the history of the multiverse, soaking up every experience that he can. Tyne may be somewhat reminiscent of the Doctor from Doctor Who, he is a lone man spiraling through time. He can be an interesting stranger to introduce to a campaign, appearing for a moment, and then disapearing, possibly with important knowledge to the players. One fun way to introduce Tyne is to have him already know your players the first time they meet. The first time for the players may not be his first time, in fact you could go so far as to make it the last time for him, and have them meet him on his deathbed, he considers them old friends, while they don't quite know what to make of this strange old man. One lifetime in the entirety of the history and future of the multiverse is a very short amount of time, but you can explain that he tends to gravitate towards certain important people, and that he has lived an incredibly long time. Every time your players encounter Tyne it should be at a different point in his timeline, meaning they won't be sequential. Sometimes he may not remember their last meeting, because he hasn't experienced it yet, other times he has knowledge of some future event. He should be careful giving them too much information, to preserve the timeline. Play around with time stuff, and don't have him become too major of a player in the campign. Try to keep him a mystery. I stumbled on this strange letter the other day. I decided to post it here to Master of Dungeons. Any morally questionable group looking for profit would likely do well working as thieves, or any upstanding group of adventurers could likely help the poor submarine captain out. Bartholomew Engle's Gambling, Games and Recreation (or BEGGAR for short, which also doubles as what many of our customers turn into) has long been the most profitable gambling establishment in the southern isles. Sadly our exponential increases in profits have temporarily stalled, due to hurricane season causing the ferry in to be less than appealing to the usual tourists. We've tried everything, from offering discount rates, to an ill-advised foray into hot air balloon travel (now we know that hot air balloon travel is if anything, more dangerous in a hurricane). Our newest venture however has been much more profitable. As you most deep-pocketed of investors surely remember, this humble gnome acquired a large submersible craft last year, after a wealthy Atlantean literally "bet the boat" playing orcish bone toss. I've had the island's most skilled engineers modifying the craft all year, and now I am proud to the BEGGAR Submersible (or BEGGARS for short). This underwater craft will travel the coasts of the most wealthy kingdoms and free cities, staying while the profit is good, and then setting sail (proverbially, the craft as I understand it uses a system of pulleys and arcane magic) for brighter horizons. Now I know what you may be thinking, it sounds very costly to transport the profits back to the southern isles. This is most definitely true, oh most astute of financial backers, that is why I have devised the most devious of plans. When the boat starts to get bogged down with gold and gems, I will hire a band of thieves to steal the treasure, delivering it to me safe and sound at the main BEGGAR. Then I will make an insurance claim towards those greedy dwarves, who will also deliver safely to the island. Add in the extra benefit of docking the captain's wages, for allowing this heinous robbery to occur. For this reason, and to get him out of my hair, I've appointed my dim-witted brother to captain this vessel. Maybe if I get lucky he'll go down in a blaze of glory trying to defend the treasure after three or four robberies. As long as my brother isn't smart enough to hire additional security, in the form of adventurers from the mainland, our plan should be foolproof. Soon, I'll pay the thieves to sink the ship, as well as robbing it, the added insurance payout will definitely boost our profits, and by then hurricane season will be over and no one will be the wiser. 1 Lannercost - A small mining village with a terrible secret. A year ago a deadly disease spread through the town, killing 90% of its inhabitants. Survivors were left crippled and unable to work. The town is very remote and profits from the mine were required to ship in food and the medicine required for the survivors. One of the survivors was a necromancer named Peln, now the mayor of this town, he kept the mine running by animating the corpses of those who fell to the disease. The townspeople are very ashamed of this, and strive to keep it a secret from any visitors, which is difficult because it is obvious that grueling physical labour would be impossible for any of the villagers. 2 Solaris - A town of crazed sun worshippers. Teenage boys, on the day they become a man must stand out in the sun and pray. The unworthy are burned by the sun, killed where they stand, or so the townspeople believe. In reality a sorcerer hermit on a nearby hill takes pleasure in tricking the town. Killing teenagers at random. 3 Sutton - This village exists far from a major road, and rarely sees visitors. Everyone in the town is human, and they haven't had a non-human visitor in generations. They long to see an elf or a dwarf and would treat any who entered their town better than a king. 4 Woodpine - This incredibly small hamlet consists of a large inn, and some surrounding farms. The innkeeper/mayor is very charismatic and seemingly kind-hearted. He will offer to lock valuables in a safe for anyone staying at his inn, but then steal the items in the night and hide out in a nearby barn, waiting for the visitors to give up and leave town. 5 Downwich - This town of halflings, dwarves, and gnomes have built their buildings with shorter ceilings and entrances than most races would be comfortable with. All chairs, beds, and tables are also built with their smaller stature in mind. The townspeople are ill-tempered towards anyone over five feet tall. 6 Addersfield - This lucky village hasn't had any trouble with monsters or calamity in generations. Adventurers pass by frequently, telling their tales of glory in the local tavern, but the villagers are all very skeptical, assuming adventurers to just be liars and exaggerators. 7 Oldham - An incredibly spiritual town, Oldham has hundreds of books of prophecy, predicting the future of the town. Every citizen knows the prophecies by heart. Many outsiders doubt the legitimacy of the prophecies, blaming some ancestor of the town making up stories for attention. The sheer number of prophecies means that nearly anything out of the ordinary seems to fit one or the other of the vague predictions. Especially the entrance of a group of adventurers. 8 Westray - All of the adults of this town have mysteriously vanished. Children work the farms and shops, and refuse to answer any questions about where the adults are. 9 Berxley - This fishing village is interested in one thing and one thing only, fish. They will attempt to turn any conversation into one about fish. Stories about glory and battle by adventurers passing through the town are usually countered with a firm, "That isn't anything impressive, last week Gaustin caught a pickerel that was as big as my leg". 10 Lemontree - The mayor of this town is thought to be a powerful wizard, who tamed the once rugged, dangerous town with his strong magic. In reality he is a charlatan, using simple tricks of the light, pulleys, and invention to trick the town into thinking he is a powerful wizard. His intentions are noble though, the town was one a very dangerous place, and he was able to drive out the criminals, and keep the citizens from getting into trouble out of fear. I apologize for missing blog posts the last few days. I'd tried to build up a buffer, but ended up failing. I've got a wedding coming up and this weekend was my bachelor party. I will strive to stay on schedule from now on, but as time approaches the wedding we may fall off track again. Normal posting schedule will resume tomorrow. I recently picked up The Planewalker's Handbook off of Amazon. I really enjoyed it and would highly recommend it to any DMs or players who are interested in introducing planar travel, or the planes in any way into their campaign. Full Disclosure: That link is an Amazon affiliate link. From time to time I plan on linking to products that are available on Amazon. I will in no way let the fact that I may make money from sales affect what I say about the book. (I have a book review coming next week which will likely be very negative). However, I'm pretty broke, getting married in a few weeks, and could use the extra cash. It's extremely unlikely I'll even make back the money I paid for the book, but every little bit helps. This book is amazing. It is completely player-friendly, but a great pickup for any dungeon master. I found a ton of inspiration in this book that I'm going to use in my upcoming adventures. I know that the 5th edition Dungeon Master's Guide does a good job of explaining the different planes and updating the multiverse, but it doesn't spend much time on what it is like to BE a planewalker. Each plane is explained in amazing detail, including a great introduction to Sigil, the capital of Outland and home of many gates and portals. The best thing about this book, is that even though it is written for an older edition of Dungeons and Dragons, there are very little rules or statistics in the manual that couldn't be easily adapted to any version. Most of the rules are explained without referring to stats or rolls, such as how portals are opened or closed, or how to join a faction. The information on planar factions are the number one reason I would by this book. The factions are split up not by race or geographic location, so much as ideals and belief systems. My favourite faction, one that I am definitely going to introduce into my campaign, is the Sensates. The Sensates are a faction who's sole desire is to experience as much of the multiverse as possible, through their senses (thus the name) of sight, sound, touch, taste, and smell. They store the memories of these experiences in a vault at their headquarters, that others can come and experience. I would highly recommend this book. It is fun to read, and super easy to adapt to whatever RPG system you are currently using. Buy it here if you feel like supporting me, if not I definitely think you should seek it out.